When people see this baby, they laugh. They make fun of him, joke on him and also tease him about his shoe size. He ignores them and goes on by himself, thinking and hoping they’ll stop. He’s sweet, kind, and fun to be around, but everyone else thinks he’s a mean and evil baby. His nick name is Mini-Mee, he’s only a one-year-old angry angel baby. Deep down in his heart he wishes he was older, bigger, wiser, and stronger. Mini-Mee has angel wings with an evil look on his face, his hair curls at the top, and his cheeks are fat. 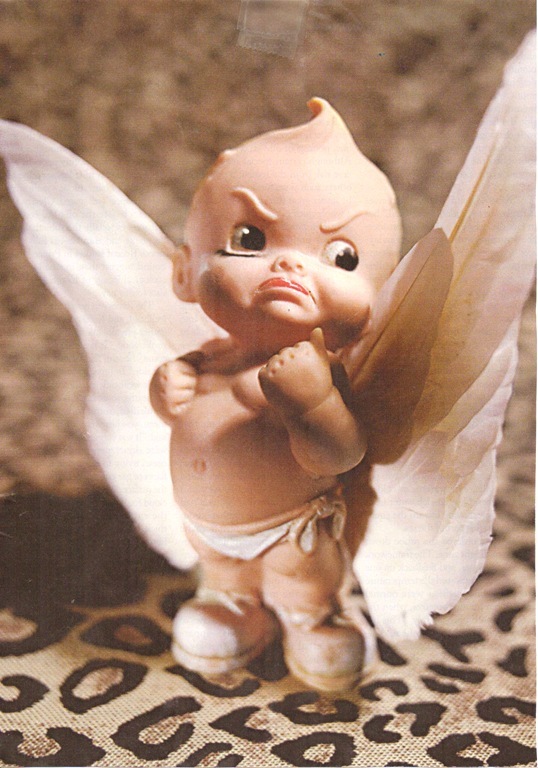 The angry angel baby finally realizes that everybody’s not perfect, everyone’s not cute, but people have problems in life. Now that frown on Mini-Mee’s face turned into a smile, and it doesn’t matter who picks on him, he’s still an angel.